Rod Boula, CEO at Calais Regional Hospital, left, listens as Congressman Bruce Poliquin duscusses the problems posed by the VA’s slow repayment process. Maine hospital officials say the VA Choice Program is being undermined by the U.S. Department of Veterans' Affairs inability to promptly reimburse them for the care they deliver. 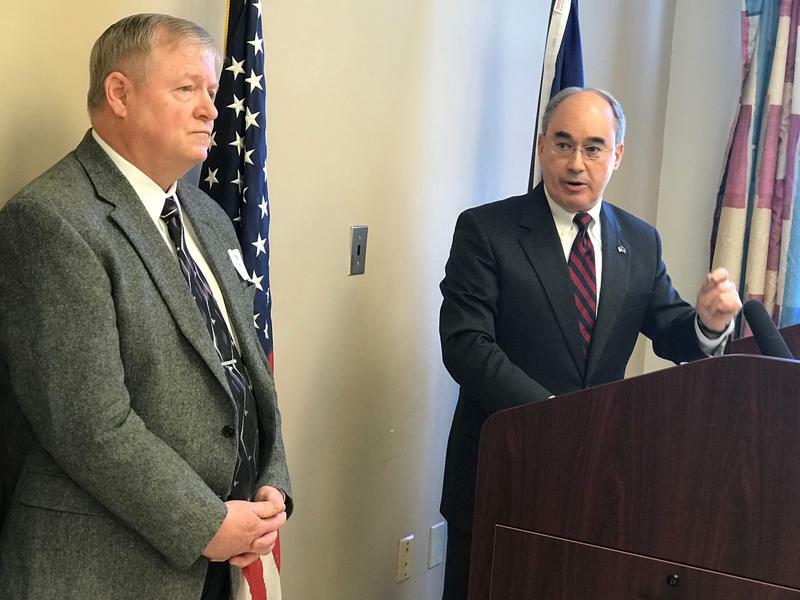 2nd District Congressperson Bruce Poliquin said he is committed to clearing the bottleneck of more than $10 million dollars in VA back payments to Maine hospitals. 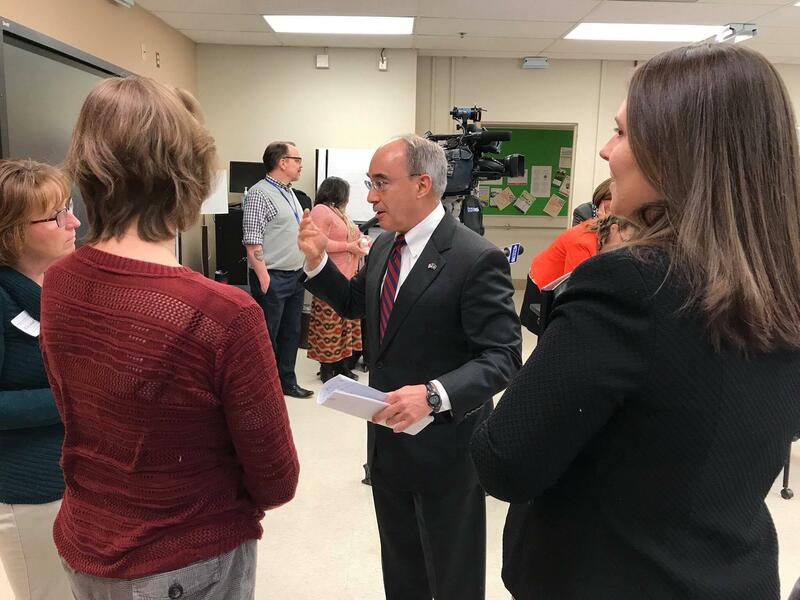 "When you have a rural hospital that contracts with the VA to provide services for veterans, those hospitals need to get paid, and paid on time," Poliquin said. The VA is supposed to pay Maine's hospitals that participate in the VA Choice program within 90 days. The program is an option that allows veterans to receive medical care closer to home instead of driving to the Togus facility in Augusta. But Maine hospital representatives say the VA is up to two years behind with the payments, and for some smaller medical facilities operating on tight margins, the back payments are potentially crucial to the facility's solvency. "26 of the 36 hospitals in this state are struggling financially," said Rod Boula, CEO at Calais Regional Hospital. "Three hospitals have closed in Maine since 2013. We don't want to be the fourth, fifth or sixth. We don't want to be closed at all. We want to remain open." Poliquin said he became aware of the slow reimbursement process for the VA claims at Calais Regional Hospital last year. As the months rolled by and the payments were still not received, the congressman said he demanded a meeting with Health Net Federal Services, a third party intermediary that coordinates care for veterans. "Last October I had had enough," Poliquin said. "I got in the car with two of my staffers and we drove out to the headquarters of Health Net. We walked in unannounced, and I demanded to see the president of Health Net, and I was not going to leave until I met with him. We shut the door and we were in there for one hour. And I told him I was not going to leave ‘until you commit to me that we're going to get Calais hospital paid, so they can meet payroll.’"
Poliquin said the company responded and within a week of his visit, repayment arrangements were made with Calais regional Hospital. But slow VA payments continue and Poliquin said he helped to found the Congressional Rural Hospitals Caucus to help address this issue. Lisa Harvey McPherson, representing Eastern Maine Health Systems, said that three years ago hospitals in her organization were owed about $12 million in VA payments. Those were paid but, she said the problem has resurfaced. "What we realize now is this is cyclical in nature," McPherson said. "We've pretty much cleared up those claims from 2013. 2014, 2015. But yet today in 2018, we're working on claims from 2016-2017. We are fundamentally challenged to fix this." Poliquin said he is hopeful that new priority that he and others in Congress are placing on the VA will result in a new and more timely payment process. In January, VA Secretary David J. Shulkin issued a press release promising that improving the timeliness of payments to community providers remains a critical element of the VA’s overall goals. This story was originally published March 26, 2018 at 2:47 p.m. ET.